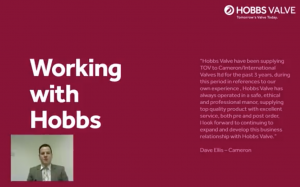 Hobbs Valve has just published a series of pre-recorded webinars on its website, viewable here. 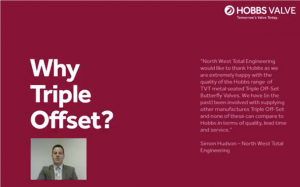 The collection of videos (also available on our YouTube channel) feature our Group Sales Director, Gavin Wheeler, explaining the features and benefits of the Hobbs Valve triple offset butterfly valve, what we like to call Tomorrow’s Valve Today. 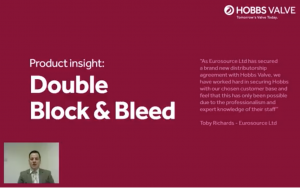 In addition, Gavin is keen to present webinars directly to clients and prospects on request. 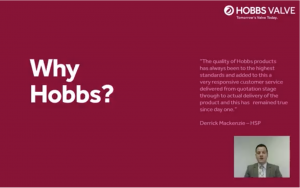 If you’d like to organise a Hobbs webinar for your team, please contact Gavin on 07983 805408 or gavinwheeler@gbvalvegroup.co.uk.